Located in Medford, New Jersey, the award winning, Printing, Fulfillment & Mailing Group, LLC. has grown into one of the premier print distributors in the country. The PFM Group consistently ranks in the “Top 100 Print Distributors” nationally by Print Solutions and Print Professional Magazines. The PFM Group is a unique mix of highly trained professionals who can handle your project from start to finish and help bring your project in on time and within budget. The PFM Group uses best practice methodologies to ensure your projects are planned, managed, and completed as effectively as possible. We work with you to clearly understand your needs, your market conditions, and bring the best solutions to fruition. Please contact us to learn how we can help you succeed. Our mission is to assist our clients by helping them achieve their goals. We can assist with graphic design, provide a wide-array of printing and finishing, packaging design and production, warehousing and fulfillment, green printing, product fulfillment services, direct mail resources, promotional products of the highest quality, apparel including Adidas, Izod and Nike. Our expertise enables our clients to focus on managing their business while we produce effective means of communicating with their clients and prospects. Additionally we offer print outsourcing and web-based inventory management to further assist our clients. The PFM Group delivers quality marketing communications by being resourceful, identifying the best talents for the project, anticipating needs, being responsive to requests, and attentive to details. 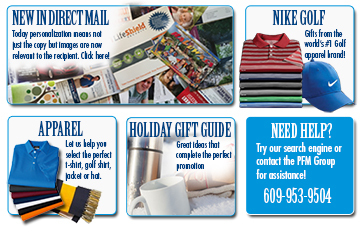 Please consider The PFM Group for your printing, product fulfillment services, direct mail, or promotional product needs. Additionally, we offer our “Strategic Outsourcing Program” for print, promotional products, design, warehousing and distribution services. We specialize in assisting our customers reach their goals and improve their return on investment. Please contact us to learn how we can help you succeed. Call or email us today at (609) 953-9500 or info@thepfmgroup.com. The PFM Group provides Printing, Fulfillment, Direct Mail, Promotional Products, Apparel, Graphic Design, Packaging, Green Printing, Warehousing, Print Outsourcing, Web-Based Inventory Management, for companies located in the Philadelphia Metro Area, including New Jersey and Pennsylvania region.